When renting a car in Australia or New Zealand, it is very important to have quality insurance coverage for the vehicle. You have several options available, and by comparing and contrasting the different types of insurance, you can have a better idea of what you might need. Many times, the credit cards you already have in your wallet will actually have collision coverage included on them. If you choose the right credit card to pay for the rental, you could actually receive coverage with zero deductible, or at least a very low deductible. This is quite different from the high cost of insurance through the car rental companies. The right card has the potential to provide coverage for any of the costs for which you might be liable, such as damage to the car, or even a theft. There are two issues consumers should keep in mind when using this method of coverage for their rental vehicles. Check your credit card’s fine print related to rental car coverage exceptions. Often credit cards only cover the rental company’s standard CDW inclusions. This can mean things like windscreen, tyres, undercarriage and hail damage for example, are not included. As a rule of thumb, if the fine print does not say that these items are included in coverage, then safer to assume they are not, and then consider using a different credit card or another method of coverage. Secondly it can be a hassle to deal with the credit card companies in the advent of a claim. Still, given the amount that you could possibly save in the event of an accident, it does make sense at least to consider utilizing credit card coverage for the rental. In some cases, you may also have collision coverage available through your travel company. If you buy a travel insurance policy for your vacation through many companies in Australia and New Zealand, you will have the option of adding on insurance for your car rentals. However, it is important to make sure that the amount of excess coverage is high enough (at least $4000) and check the fine print for exclusions. 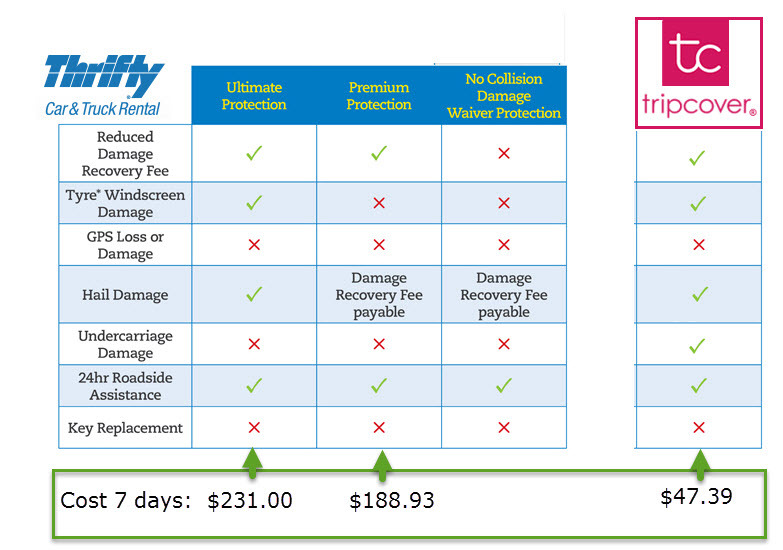 Similar to credit card cover, travel insurance often only covers the rental company’s standard damage and CDW. For example when renting with Thrifty the standard damage does not include windscreen, undercarriage, single vehicle accidents and hail damage. In this case if your travel insurance only covers standard damage, then it won’t be enough to cover these items. Of course, there’s always the option of buying your rental insurance right through the car rental company. This is something they will actually encourage you to do. It’s a simple solution since you can do it right at the counter. However, that does not necessarily mean it is the best solution. The cost of the insurance through the company is expensive, and could be close to the cost of the rental itself, which could double your overall expenditure. When you buy insurance through the rental company, you should not think that it will automatically cover the entire cost of damage or theft. Look at what you’re deductible or excess will be. It can be in the thousands in many cases and often you need to buy the premium coverage option to be fully covered and reduce your excess to zero. A newer and lesser known alternative to credit cards, travel insurance and insurance direct with rental companies, is car rental reimbursement insurance. It works very similar to the rental company’s cover, however it costs significantly less, as low as $6.77 per day for a seven day rental, and can be purchased independent of the rental company. This mean that if you damage the rental car, the rental company will still deduct the applicable excess amount from your credit card, however if you have purchased a reimbursement policy, then you receive a refund within 10 days of the claim being made, provided you have driven the car within terms and conditions of the rental contract. 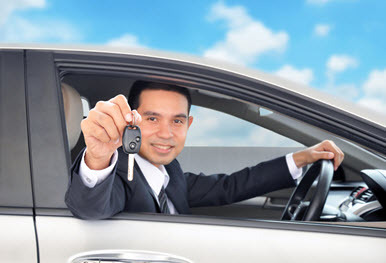 Australia first car rental reimbursement cover provider is Tripcover.com.au, which offers such cover for Australian resident travelling in Australia and around the world, as well as cover to international visitors to Australia. A rental car insurance for New Zealand residents is also available. The products are created and managed in partnership with Allianz Global Assistance. Take the time to research all of your options for your car rental insurance, and then choose the one that makes the best financial and coverage sense for you. Why Are Car Rental CDW Costs so High with Major Rental Firms? The CDW, or collision damage waiver, that the car rental companies offer is not actually a type of insurance, although many people mistake it for such. 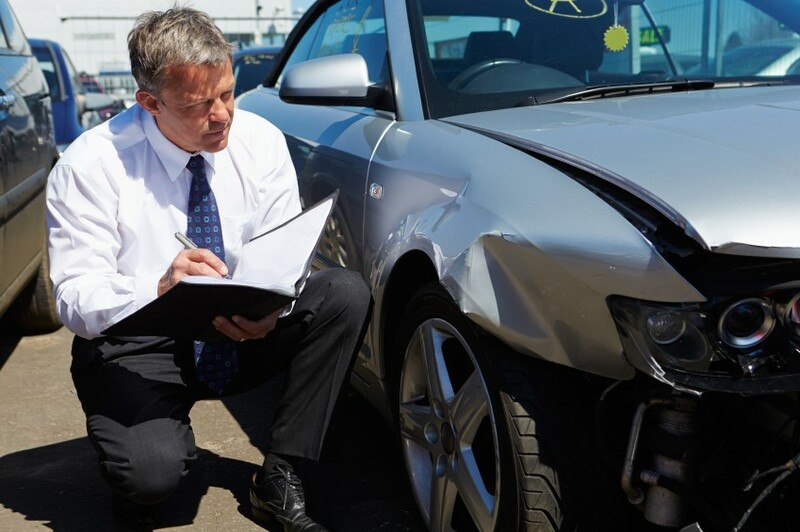 Instead, it is a waiver, which means the rental company will waive their right to collect a massive deductible from you if you happen to damage their vehicle. The waiver does not remove the deductible entirely. It will lower it though, and since they are generally so high with car rental companies, this might seem like a good deal at the outset. What Do the CDWs Cost? The price of the CDW varies from company to company, naturally. The average price tends to hover around $26 AUD, but it could be higher depending on the company you choose. If you are renting a vehicle for a full week, then you can expect to pay around $188 AUD on the waiver at least. Some see the CDW as being a waste of money, and when you consider just how expensive it can be, it’s easy to see that reasoning. However, those who do not have supplemental insurance to cover collision damage could be in for a rude surprise if they damage the vehicle. The cost of the deductible, in the Australian market, can be as high as $6000. The insurance companies charge high rates because they know that people will often pay them so they can reduce the deductible, and that consumers are often ignorant of other options, such as excess reimbursement insurance. One of the other things to consider with the CDWs is that they may have coverage gaps. This means that they might not cover damage to certain parts of the vehicle, such as the windshield, for example. Do You Need to Have a CDW? Some people automatically buy the CDW and just factor it into the cost whenever they rent a vehicle. However, that might not always be necessary. In fact, many times, the insurance policy for your regular everyday vehicle might extend to rental cars. This usually isn’t the care in Australia, but often is in the US. In this case, if your deductible on your regular policy is better than the CDW, and you do not have to pay for it, then simply using your current insurance is a smarter and more cost effective option. There are several alternatives to buying the CDW, are your travel insurance policy and your credit card company. Some credit card companies offer collision damage coverage free to their users. Others may charge a small fee. They can cover more than just the collision damage as well. If you have a travel insurance policy for your trip, it will generally have some type of car insurance included along with it. However be very careful with this option, given standard travel insurance policies tend to cover only the “standard damage” covered by the rental company CDW. So if you look at the third column from the left of Thrifty’s coverage, these are the only things that are covered by standard CDW e.g. windscreen, undercarriage and hail damage are all not covered by the standard Thrify CDW, hence unless your travel insurance policy explicitly says that it covers “windscreen, undercarriage and hail damage” then chances are that you wont be covered. While choosing or not choosing the CDW is ultimately your decision, some far better alternatives are out there that will help you save money and actually provide you with better coverage. Always look at all of your options before you simply buy what the rental company tells you do buy.